By using medical grade thermoplastic elastomer (TPE) of the THERMOLAST M series from Kraiburg TPE, Abu Dhabi Medical Devices Company (ADMD) is able to produce single-use syringes that eliminate the threat of dangerous infections. Especially in developing countries, syringes that are contaminated through reuse cause innumerable infections, often with life-threatening consequences. The Middle Eastern company ADMD comes up with a solution – an Auto Disable syringe (AD Syringe) that cannot be refilled and reused. The suction from filling the syringe with liquid activates an integrated one-way valve. After the medicine is injected, a plastic pin in a TPE seal closes the opening to the needle. The needle is blocked, preventing reuse of the syringe, effectively eliminates the risk of transmitting infections from one patient to another by pathogens carried by the blood, such as HIV or hepatitis B. As said, global health organizations such as WHO, UNICEF, PAHO and UNRWA acclaim these syringes and use them in their vaccination programs around the world. The TPE seal is made of Kraiburg TPE’s THERMOLAST M series, which has low compression set values and has been awarded comprehensive medical certifications (USP Class VI, USP 661, DIN ISO 10993-4 “Haemolysis, indirect in human blood”, ISO 10993-5 “Cytotoxicity”, ISO 10993-10 “Intracutaneous Irritation”, ISO 10993-11 “Acute Systemic Toxicity”). In the single use syringe application, the seal is manufactured by injection molding, then colored in conformity with medical regulations and manually inserted into the syringe. “We chose Kraiburg TPE as our development partner in this ambitious project because THERMOLAST M has all the relevant ISO10993 certifications and provides a reliable seal for our system in contact with media,” explained Mounir Haddad, General Manager of ADMD. The cooperation is now extended to two syringe types of different sizes. In addition, ADMD successfully launched a patented AD NEEDLE, with the same technology as the AD Syringe. 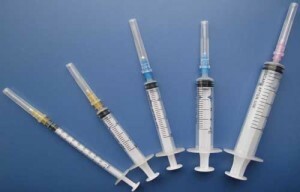 The needle can be sold in bulk packaged. It can be mounted on single-use standard syringes or prefilled syringes.